I started collecting and restoring G1 mlps several months ago and found this site doing research for the gals I've acquired. Just a little about me: I'm going to school for nursing and work at a vet clinic to pay expenses (money makes the world go round) I raise boer and Pygmy goats and should be having babies at the end of April! I love to sing and quote Disney movies and of course I love my little pony! Can't wait to get to know you guys! Welcome to the forums! Disney is relatively popular here as well. I love singing "Part of your world" from the Little Mermaid when I'm alone at work. 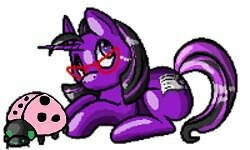 Welcome, big pony and Disney fan here too. Glad you joined us. Congrats on those little babies on the way. Hiya missdottie! Welcome to the board! I have pygmy goats as well! We just had an adorable little billy born, we named him Hopscotch. All little kids love to jump of course, but he seems to have extra jumping beans in his back pocket or he eats springs, because he just bounces everywhere he goes. I'd love to have some boers, just not in my budget at the moment. I'd love to see pics of your babies if you have them! Welcome! Lots of animal lovers here, you must share pics of baby goats when they arrive!!! !